Toyota has offered the mid-sized Camry sedan for decades. Remaining one of the most popular vehicles of all time, the 2017 Toyota Camry In Bozeman offers unrivaled value and dependability. When the others give up, the Camry keeps on giving and provides carefully balanced specifications to ensure maximum economy and minimal weight. Ressler Motors backs the Camry with impeccable automotive dealership customer service and a range of financing options, ensuring that your new Camry suits you and your lifestyle in every way. 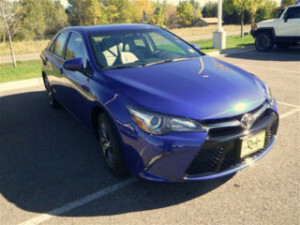 Even though the 2017 Toyota Camry In Bozeman presents as a sensible sedan, you will enjoy the surprising driver’s delight with the available 3.5L V6 engine, complete with sporty drive and responsive suspension. This vehicle does more than just get you from A to B, it offers a refined experience with carefully chosen componentry to give you the driving experience you are craving, even if what you are wanting differs from one day to the next. Awarded the NHTSA 5-star overall safety rating, you can be assured that the 2017 Toyota Camry In Bozeman has a focus on taking care of its occupants. Whichever position you are seated in, active and passive safety systems are present for your safety. Blind spot monitoring keeps an extra set of eyes on the road and you will love dynamic radar cruise control. Toyota aim to make the drive easier and are sure you will agree the Camry achieves this goal. There is one thing that the Camry can be counted on for. A choice of colors that present the vehicle in a stately and mature manner. When you purchase a 2017 Toyota Camry In Bozeman, you won’t have to worry that the only one left will be a crazy, bright, unpopular color. Every hue has been chosen to present a sophisticated image. See them at Ressler Motors and choose the one that suits you best.